- 8 minutes from Old Quebec and downtown! - 5 minutes from the Montmorency Falls! - 5 minutes from the beautiful Île d'Orléans! * A/C on the rooms floor. 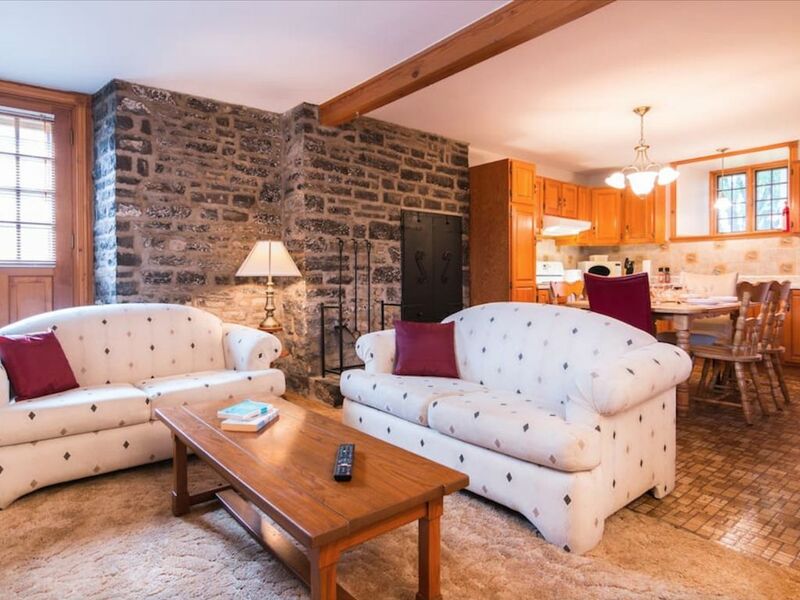 Located in the historic borough of Beauport, the apartment is part of a 2-unit home that is characterized by large, deep windows and stone walls that create a warm and comfortable atmosphere in the house. You have access to a huge courtyard common to both dwellings. You will find a picnic table for your outdoor dining and Adirondack chairs for your relaxing moments. A public park with games for children is connected to the courtyard. A clothesline to dry your clothes is also at your disposal. The historic borough of Beauport is located on the Beauport coast, with terraces offering panoramic views of the St. Lawrence River and Île d'Orléans. It has more than 650 residential and institutional buildings, which testify to the architecture of the XVIIIth to the XXth century. The majority of these buildings are located along the sinuous and ascending route from west to east formed by the Royal Road and the Avenue Royale. The secondary streets, oblique to the main track, recall the orientation of the initial plots. The historic borough is located in the borough of Beauport, Quebec City. It comprises two listed historical monuments, namely the houses Girardin and Tessier-Dit-Laplante. It also has several Euro-Quebec sites listed on the Inventory of Archaeological Sites in Québec. Bus stop # 800 is 2 minutes walk from the apartment. It reaches downtown as well as Old Québec in 35 minutes. Departures are 10 minutes during the day and 15 minutes in the evening. All new pillows, sheets, covers and towels. We stayed here for Christmas 2018 and were thoroughly impressed. Oftentimes the pictures over the internet are nothing like the actual accommodations. Not true with this apartment! It was adorable and exactly as the pics showed. Super clean, kitchen utensils and spices and extras were fabulous, and it felt like home. The only points to consider are that the apartment is a drive to Old Quebec and not right in the heart of it. It's only about 10 minutes drive. Also this is a bottom floor of an apartment. So you do hear your upstairs neighbors. We are heavy sleepers so it didn't matter, but you will likely hear commotion from upstairs. Overall though we were very happy and impressed and had a wonderful time! Clean, Comfortable accommodations in historic home with great location! This apartment was perfect for our stay in Quebec City. It was clean, comfortable and had everything we needed. It is 2 blocks from the stop for the 800 bus that goes to downtown and Old Quebec City and a short ( less than 10 minute) drive to both lower and upper parking lot for Montmorency Falls and Ile d'Orleans. Wendake village is also only a 23 minute drive. Our host was very helpful and great at communicating with us. We will recommend these accommodations to friends and family traveling to Quebec City and hope to return some day. Nice location to use as a central point when visiting the Quebec City area. Less than 10 minutes to center of city on a bus route. A little street noise, but in an otherwise quiet neighborhood. Several diner type restaurants in the area. Would stay there again. Owner was helpful in getting wi-fi set up. Great location! Great distance from Old Quebec. Well kept place, and everything is provided. Our request for an early check was accommodated. LOVED IT! Very comfortable. Well appointed kitchen. Convenient location! My husband, my three young adult daughters (17-24yrs) and I had a wonderful stay during the Christmas holiday. So CUTE: the place was decorated with garland and a tree. The beds are comfy and the heat works well. There is plenty of hot water with good pressure. The nice combined living/kitchen area lent itself to cozy family time. The kitchen had all the right kinds of pans and utensils. Also, we were pleased to find maps, guide books, storage tubs, plastic wrap, teas, sugar and spices! This place is perfect for an older family or two couples. Families with babies or young children should note that upstairs renters can be noisy. (The first of two groups renting upstairs were super loud. The second was quiet.) We would definitely stay here again!! Very easy to find and convenient to all we did! Host thought of absolutely everything! We arrived at the rental and were so pleased to see how clean everything was. Beds, couches were very comfortable. The best thing was that everything- I mean everything was supplied. We found all cooking supplies neatly nestled in the closet. There was paper towels, tissues, toilet paper, aluminum foil, plastic wrap etc...etc. There were plenty of towels, sheets etc. This host was really exceptional. We have travelled and rented apartments all over the world and this rental was the most generous in supplying the necessities.